Targeting and catching carp on ice has been on my bucket list for a while. I tried a couple times in the past, but wasn't successful, as carp are notoriously tough to catch when the water temperature is near the freezing point. While one may find large concentrations of carp and other warm water species huddled up in huge schools unders ice, they aren't there to feed, it's usually a matter of conserving energy and staying out of current or in slightly warmer water. 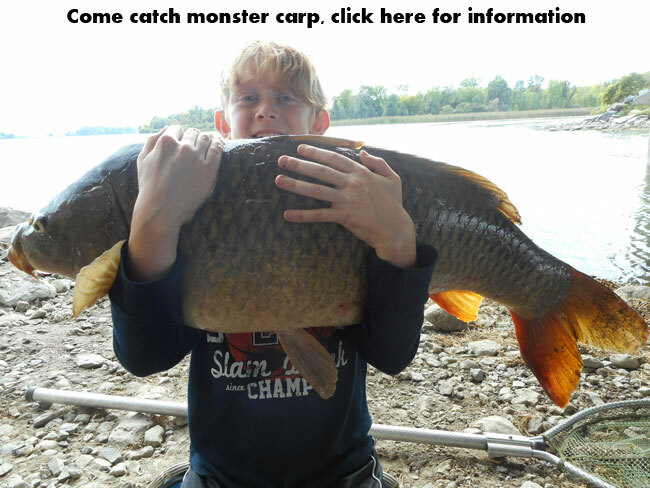 This leaves the carp, and some other warm water species such as catfish, gar, etc very vulnerable to illegal/unsportsmanlike snagging. The spot I originally tried a few years back is well known by snaggers that show there every winter, and after witnessing their illegal activities while I was staying legal and not catching any carp myself, kind of put me off the idea for a while. 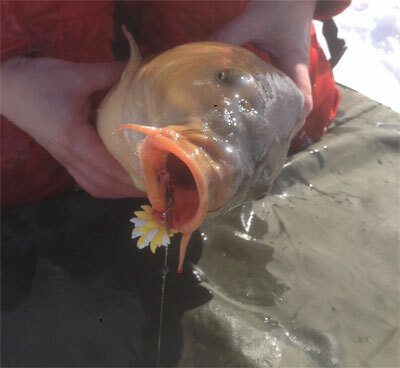 Last winter, my friend Andrew started successfully catching carp through the ice. I was excited about this news, as he had found a good spot, and discovered some feeding/baiting methods to get them to feed in winter, under the ice. The combination of proper winter baiting and well formulated winter bait proved very successful. 8:30 AM, he already had his lines set up. I set up 2 rods with baitrunner reels for carp, baited with C-quake boilies produced by Feedlab. I also brought along a couple of some old hand lines I had originally designed for ice fishing northern pike a few years back. 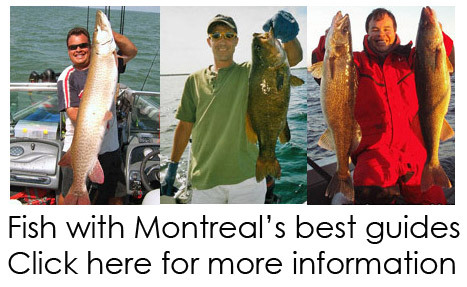 I modified them for carp, running a 7-8 foot fluorocarbon line to keep my presentation nearly invisible. 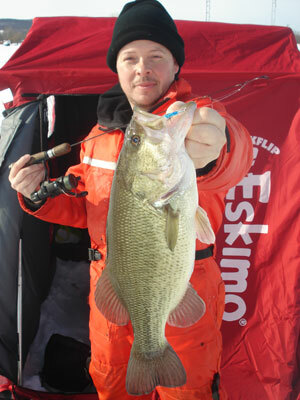 One of the handlines was actually a 7-8 foot fluorocarbon hair rig, tied directly to my mainline. I supposed the carp would be very finicky, so I avoided using a sinker on any of my lines, as their is no current in the area we fished. This would further avoid spooking them. I used my Humminbird flasher to ensure proper bait placement, on my nearly weightless rigs. As I only brought a few lines, Andrew put out some tip ups baited with live minnows, and we both set up some jigging rods for other species. To a few hours to get our first hit. One of Andrew's rods went off, and he set into his first carp of the day. As expected, the carp put up a nice fight under ice. I brought the big landing mat right up to the side of our oversized carp hole, rolled up my sleeves, and stood by ready to land to fish. When the fish eventually tired and came up the hole, I carefully slipped both hand under it to avoid touching it's gills, and eased it onto the mat. Andrew was quite happy, as the carp hit a new "maggot ball" bait he was testing. Basically a small ball of artificial maggots molded together and dipped in a pineapple scented/flavored attractant. Though we were hoping for a flurry of carp action, it didn't happen. Our 10-11 carp lines stayed completely silent. 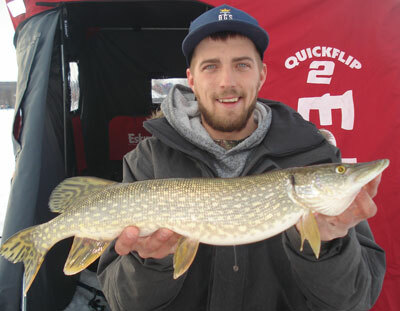 Luckily, the live minnows produced some fish, including some perch, pike and largemouth bass for Andrew. Eventually, I decided to check my handlines. In contrast to the rods that had bells or bite alarms, and the tip ups that have flags, my handlines don't have long range indication of a strike. 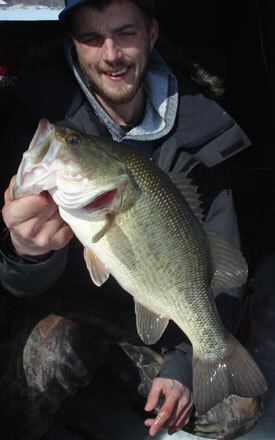 If you aren't next to the handling when a fish takes the bait, you won't see it until you check them. Luckily, they are well spooled with lots of line. Only sense of indication on them is that I have half covered in grey duct tape, so if any fish moved the line, the color change will be apparent. As my crude hand line indicator had now changed colors, I had a good suspicion that a fish had hit the bait. I slowly lifted it, and felt a very slight resistance. The line was high up in the water, so I knew there was a fish swimming with it, oblivious to my weightless, and invisible fluorocarbon presentation. 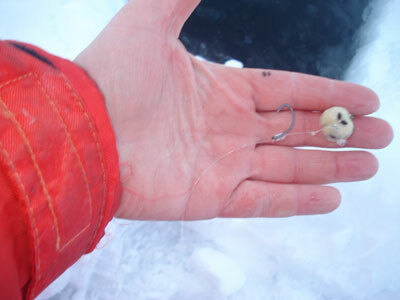 When I felt an ever slight increase in weight, a quick tug set the hook into my first carp. I was super pumped about hooking my first carp, even sweeter that it hit the only hand line we rigged for carp, as I had switched the other handline to a giant minnow for big pike. As the carp was very close to the hole when I hooked it, I was it dart down a few times, while I kept or loosened tention by pinching the line with my fingers. By far the most enjoyable handline fight I've ever had, as I typically use ice fishing rods and rarely catch put out handlines. When Andrew showed up with the mat, I eased to carp up to the ice hole, and he scooped it out of the oversized ice hole, and onto the mat. Though the carp was quite small by my standards, it was one of the most enjoyable carp fishing moments I have experience in roughly 10 years of carp fishing. 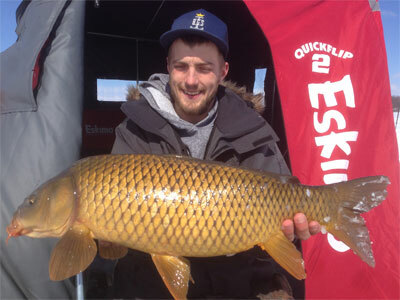 The carp was taken on a C-quake boilie produced locally in Montreal by Feedlab, a company run by my friend Phil Tabry. 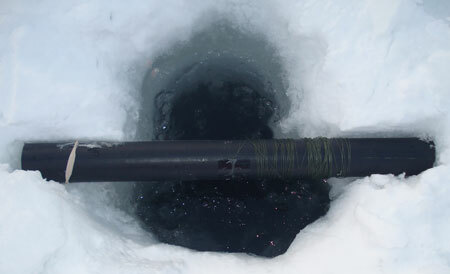 As you can see, the rig is barely visible out of water, let alone under ice. Unfortunately, we didn't get any more carp hits for the rest of the day, but I was more than happy to have experienced some carp fishing on ice, and catching my first ice carp. As got back to jigging a small Rapala W2 jigging rap tipped with a mealworm, I noticed a mark on my flasher above my lure, it came under, then up a nailed the lure hard. I knew it wasn't one the the perch we'd been catching most of the day when it pulled down and started peeling drag. After a short but feisty battle, I eased it's head up the ice hole, and I had my first bass of the day, maybe 10 minutes after releasing the carp. The days ended with some more perch, a small bass for me, and another small pike for Andrew. 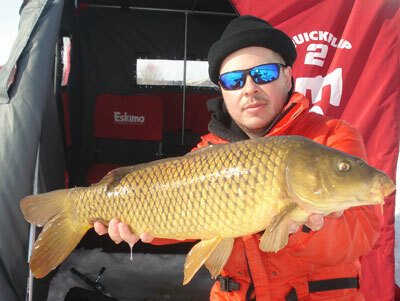 Hope to give ice fishing for carp another shot or two before the winter ends.